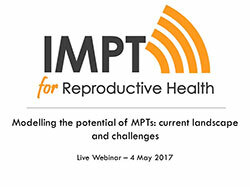 This live webinar explored the current landscape of MPT modelling around public health impact, cost-effectiveness, uptake, and other forecasting. The webinar featured a presentation by Dr. Íde Cremin (Imperial College London) around her team's complex model of the health impact and cost effectiveness of a contraceptive and HIV prevention IVR in South Africa, as well as a facilitated discussion featuring Dr. Cremin, Dr. Chelsea Polis (Guttmacher Institute), and Matthew Quaife (The London School of Hygiene & Tropical Medicine). Cremin, I., Dellplain, L., Polis, C., Quaife, M.